1. Gaza back where it started: Stop me if you’ve heard this one before, but the Gaza border region is heating up afresh, with predictions of war once again being bandied about. 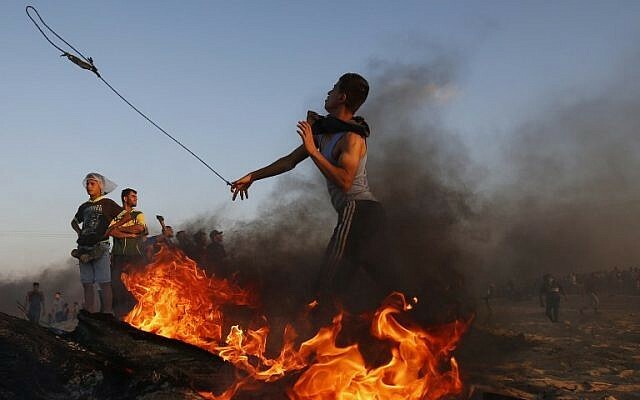 “The ground is burning,” reads a headline in Yedioth Ahronoth, after a weekend that saw over 100 explosive objects hurled at Israeli soldiers along the border, and seven Palestinians killed. “While talks between Hamas and Egypt seem stuck, the international community isn’t much interested in Gaza and Hamas is only acting to fan the flames, [and] the violence along the border is again nearing a boiling point,” the paper writes. Haaretz leads its print edition with the Gazan death toll, reporting that the seven killed, including a 12-year-old and 14-year-old, brings the number of Palestinians killed along the fence since March, when the March of Return protests began, to 193. 2. Blame Abbas: The broadsheet’s Amos Harel ties the rise in violence to a deliberate Hamas decision in reaction to the breakdown of ceasefire talks with Israel, while also pointing a finger at Palestinian Authority President Mahmoud Abbas. “When it comes to agreements, the Palestinians are worse than the British. This one and that one can’t make a deal,” he quips, seemingly a jab at the UK’s Brexit woes. 3. Internal sparring: But Israel’s government is far from united on the issue itself, with coalition party heads Avigdor Liberman and Naftali Bennett bickering over who is to blame, the latest in a long line of tiffs over Gaza between the two. The broadside refers to an Egyptian-brokered understanding with Hamas — never officially confirmed by Israel — for a calm between the sides that did hold for several weeks. “Bennett would do well to concentrate on the failings of the education system and not interfere in things that require experience, responsibility and levelheadedness,” says the party. Liberman himself hasn’t responded yet, but the comment is only slightly different from his insult a few weeks ago telling Bennett to concentrate on the pedophiles in Israeli schools. 4. Third site: Days after Prime Minister Benjamin Netanyahu revealed the existence of an alleged nuclear site in Tehran and Hezbollah missile stores in Beirut, a senior Israeli official says the prime minister planned on revealing intelligence regarding a third site, but was held back by intelligence chiefs, according to a report by Channel 10 news. The detail may seem reminiscent of White House aides holding back Trump from revealing sensitive info. However given that the source identified itself as an official, it’s more likely that this was a planned leak, a way for Netanyahu to have his cake and eat it too, by revealing that Israel knows something without giving up what — maybe to set the Iranians on edge. 5. Trying to get the world to act: Israel Hayom doesn’t cite any source in reporting that other news reports on the army and intelligence agencies being unhappy with Netanyahu’s revelation are false. The paper writes that Netanyahu made the decision to reveal info about the nuclear warehouse several weeks ago and it was picked over by the army and Mossad before he got the okay to speak publicly about it. The army even supported the move, hoping that it would spur the international community to action. The tabloid reports (also no source) that Israel will transfer more info about the site and Hezbollah activities to a number of countries in the coming days in the hopes of prompting the international community to act. According to Netanyahu’s speech, though, the info was already shared with other countries and the IAEA to no avail. 6. Bend it, or get bent? Real Madrid’s decision to honor Palestinian cause celebre Ahed Tamimi is drawing Israeli ire. Tamimi herself has never been convicted on a terror offense (her cousin helped carry out the deadly Sbarro bombing in 2001) and was jailed for slapping a soldier. But Israeli officials and some news sites still accuse the team of supporting terror or hosting a terrorist. “Soccer in support of terror,” reads a headline on the right-wing news site Mida. “Embarrassment,” reads another from the Kan state broadcaster. Most Israelis are obsessed with Spanish soccer, Tamimi or not, leading to coverage like that in the news website Walla, which contains two paragraphs about Tamimi and much more about the team’s fortunes on the pitch and reports about manager Zinedine Zidane wanting to retire earlier than thought. 7. Bless the rains: It may be the last day of September, but Israel is in the midst of a heatwave, making it feel more like the last day in July. Yedioth reports that weather in the country will turn tropical Sunday, with hot weather being accompanied by scattered rain starting at night. The paper reports that on Monday, which is the Jewish holiday of Simhat Torah, the rain is expected to strengthen, especially in the south and east of the country, with temperatures eventually sliding back to seasonal levels. While the first rains may be considered a blessing by some (Monday marks the first day when observant Jews insert a prayer for rain in services) it’s bad news for the thousands of hikers and nature lovers who normally take advantage of the holiday: The Israel Meteorological service is warning that flash floods are possible starting Sunday, especially in the south and east, where wadis pock the desert landscape.